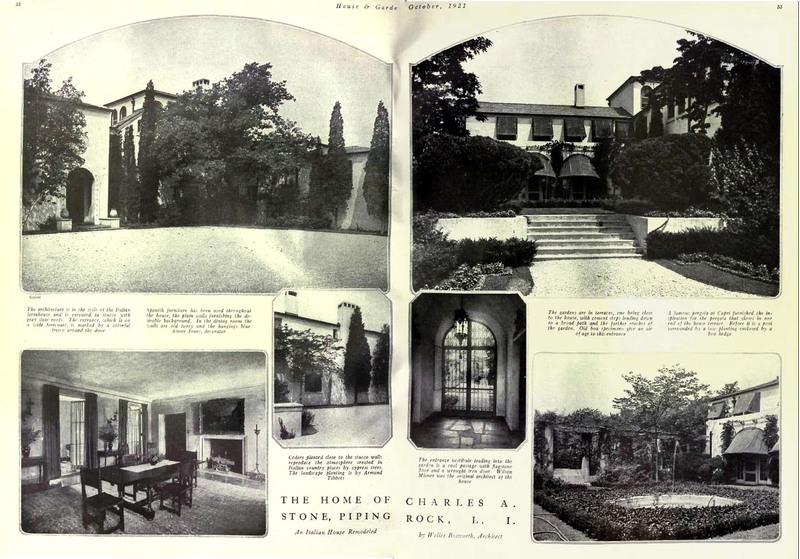 'Solana', originally the Stephen Howland Brown estate designed by Addison Mizner c. 1917 in Matinecock. This was Mizner's last Long Island commission. Brown was a governor of the New York Stock Exchange and partner in the brokerage firm of Vernon E. Brown & Co. Brown died in 1917 and it seems he never had an opportunity to live at the house. Sometime shortly afterwards it was purchased by Charles Augustus Stone Sr., a founder of Stone and Webster Inc., a very prominent engineering firm. It appears he hired William Welles Bosworth to design some alterations to the house c. 1920 before commissioning Bosworth to design an entirely new house next door in 1927. Click HERE to see 'Solana' on google earth and HERE to see it on Bing. Solana (beautiful name) Yet another amazing estate with fine lineage. this one, more than his other Long Island houses really shows that he and Palm Beach were just waiting to meet. Mizner was from the bay area and traveled extensively with his father, a lawyer who served as a diplomat including a number of years as minister to Guatemala. Hence his interest in Mediterranean architecture. His friendship in San Francisco with heiresses Virginia and Theresa Fair provided him entree to New York society (Virginia "Birdie" married William K. Vanderbilt, II and Theresa "Tessie" married Hermann Oelrichs). However, Mizner found the climate in New York City and Long Island too cold and eventually moved south to Palm Beach for his health. As DED says, Palm Beach was exactly what he needed to fully develop his Mediterranean Revival design expertise, and of course for his health! thanx zach for the mizner. beautiful place -beautiful name. a little restrained inside but i guess thats good taste. thank god he got over that when he got to florida but thats what tropical air will do for you. tiffany must have had it shipped in and breathed it from a tank.